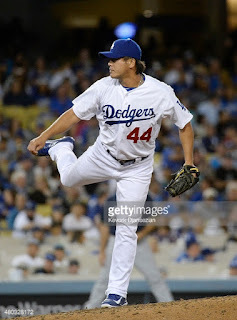 at first, i thought it would be ramon troncoso, and then perhaps eric stultz, but it turned out to be chin-hui tsao that became the most recent dodger double dipper - a dodger who left the organization for another, only to return and appear in a game for the team a second time. this was one of five dodger cards added to the dodger themed complete factory set, not the dodger team factory set. it is his only dodger card, as far as i can tell. 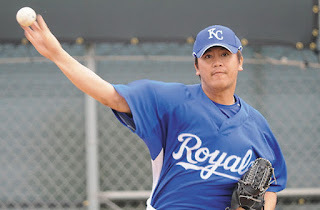 after the season ended, tsao became a free agent and signed with the kansas city royals. here is some photographic proof of that fact. the royals released tsao in may of 2008, without him having pitched in a big league game. i had not heard tsao's name mentioned since he left the dodgers eight years ago, so obviously i missed the news that they had signed him this past winter. it was only when i was watching the game against milwaukee on july 10th that i realized tsao was back. here's a getty images photo of him pitching in that game. tsao earned the win in his first big league appearance in 8 years that night, and pitched in the next day's game, too. welcome back, chin-hui tsao, and congratulations on being a dodger double dipper!